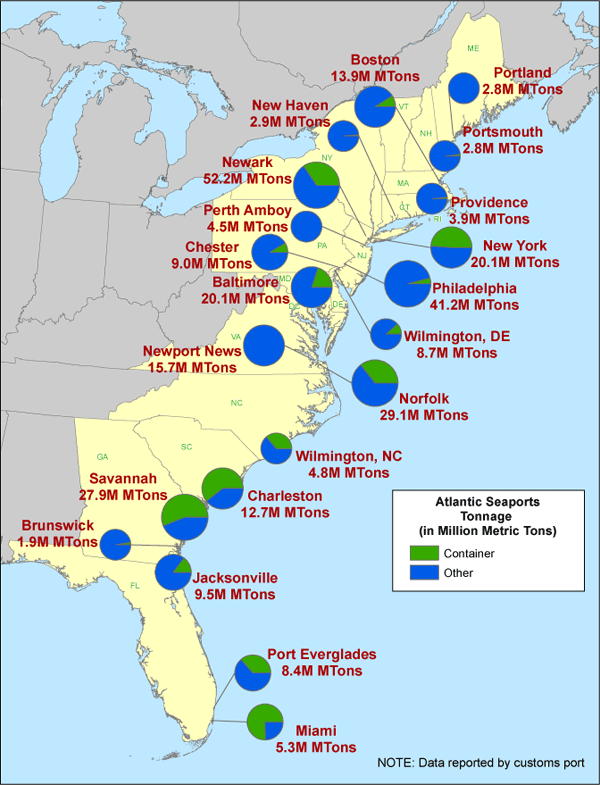 Virginia's major ports are in competition with other ports on the Atlantic Ocean and Gulf of Mexico, New York to Houston. Virginia also competes with West Coast ports, from San Diego to Vancouver. Manufacturers from Asia can deliver goods in a 40-foot or 53-foot shipping container to Los Angeles, where the shipping channel is 53' deep. Containers are loaded on a train headed to Chicago, St. Louis, or even destinations on the East Coast. Such multi-modal shipping can be faster than the all-water route through the Panama Canal to Norfolk, Portsmouth, or Newport News. The Port of Virginia relies heavily upon Federal funding to maintain and even deepen the existing shipping channels. The military presence in Hampton Roads helps get Congressional support for appropriations to improve the shipping channels and the local transportation network, both rail and highway. 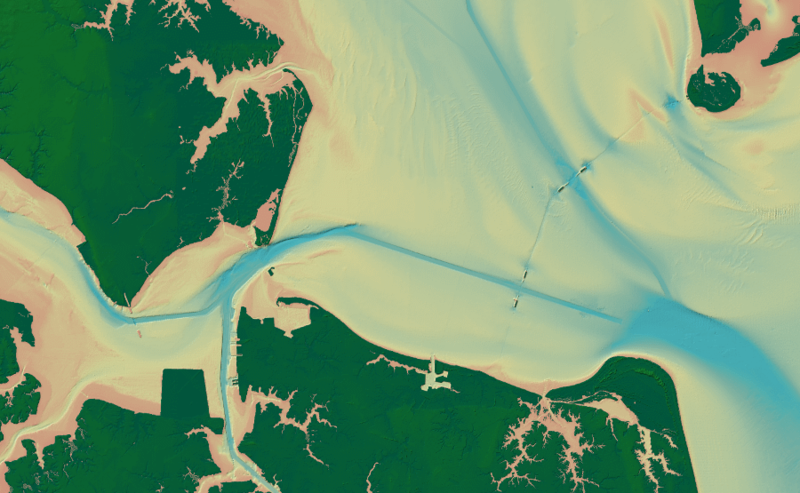 To support the US Navy and civilian traffic, the US Army Corps of Engineers now maintains a 50' deep shipping channel from the Atlantic Ocean to terminals in Hampton Roads, and a 25' deep channel up the James River to Richmond. Virginia claims to have "the deepest natural harbor on the east coast" at Norfolk, but that claim ignores the natural harbor at Eastport, Maine. That town's harbor is deeper at 60+ feet, and the granite bedrock bottom does not require regular dredging. Eastport has an appropriate name. 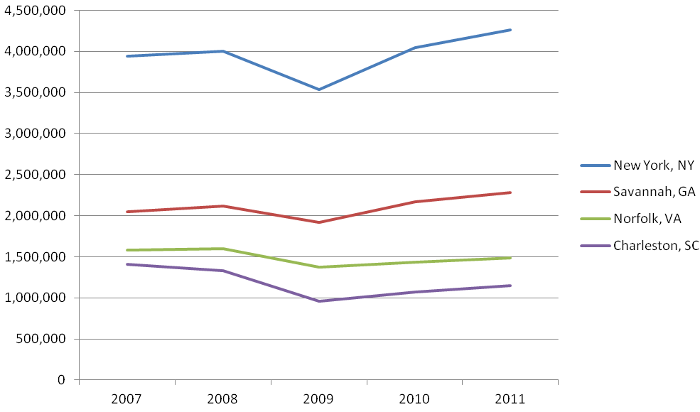 Hampton Roads offers several ports with excellent rail and road connections to inland customers. The need to deepen the natural channel was triggered initially by the construction of large warships at the U.S. Navy Yard, Norfolk (now Norfolk Naval Shipyard). The first battleships and aircraft carriers found it difficult to use the channel in the Elizabeth River, which was only 28 feet deep in some spots. On December 18, 1903, the Virginian-Pilot reported the Wright brothers had succeeded in flying a plane at Kitty Hawk, and just below that headline was a story about a Federal proposal to study dredging the channel to 30-35 feet in depth. The 11-mile long Atlantic Ocean Channel, from the deep ocean to the Thimble Shoals channel, was authorized in 1986. It was dredged in 2006 to 52 feet deep, and is authorized (but not funded) to be deepened to 57 feet. A 50-foot deep shipping channel is currently maintained from Thimble Shoals to Norfolk and Newport News by regularly dredging the bottom of the Chesapeake Bay, Elizabeth River, and James River. 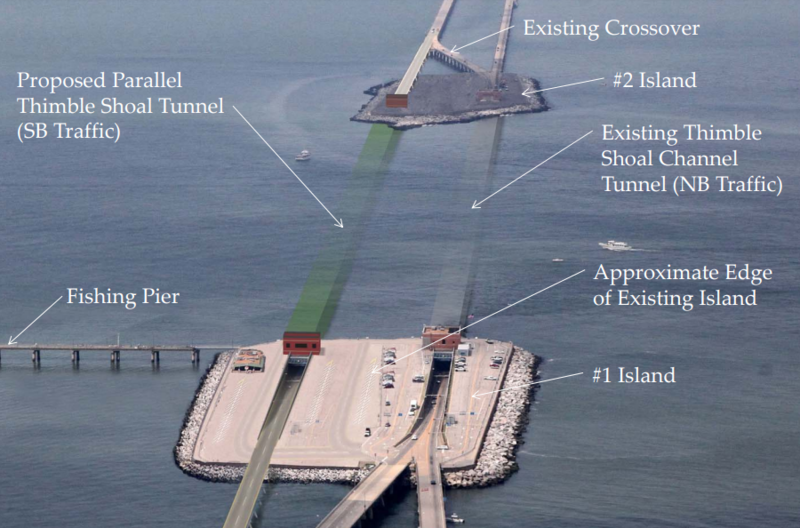 The inbound channel above the Thimble Shoals tunnel of the Chesapeake Bay Bridge-Tunnel is 350 feet wide and 50 feet deep, while the outbound channel is 650 feet wide and 50 feet deep. One of the 45 harbor pilots based at Lynnhaven Inlet in Virginia Beach guides vessels the 11 miles through the Atlantic Ocean Channel, 12 miles through the Thimble Shoals Channel, and the remaining 5 miles to the terminal where cargo is unloaded and loaded. Dredging to 55 feet and widening the channel to 1,000 feet was authorized when the US Congress passed the Water Resources Development Act (WRDA) of 1986. Getting the funding is a separate exercise than getting authorization for a river and harbor project. The US Congress has appropriated enough funding to dredge a 50-foot deep channel, but not deeper. A key step is obtaining Federal funding was crossed in 2018, when the Army Corps of Engineers endorsed the deepening/widening project. That cleared the way for including it in the next Water Resources Development Act to e passed by the US Congress. A 1,500 feet wide and 50-foot deep channel is maintained to Norfolk International Terminals (NIT). A narrower 800-foot wide and 50-foot deep channel extends south to Norfolk Southern's piers for coal exports at Lambert's Point. The Elizabeth River is dredged to its southern end, to maintain a 250-foot wide, 35-foot channel to the Atlantic Intracoastal Waterway. Thanks to the dredging, Norfolk Southern can load outbound coal ships at Lamberts Point so the bottoms sink 50-feet deep into the water at high tide. Some coal ships calling at the terminal are large enough to be loaded with enough coal to require a 60-foot draft. Since 1957, mud, sand, rocks, shells, and other material scraped up from the bottom ("dredge spoils") has been deposited into one of three cells at the Craney Island Dredged Material Management Area. One cell receives fresh dredge spoils, while two others dry out. 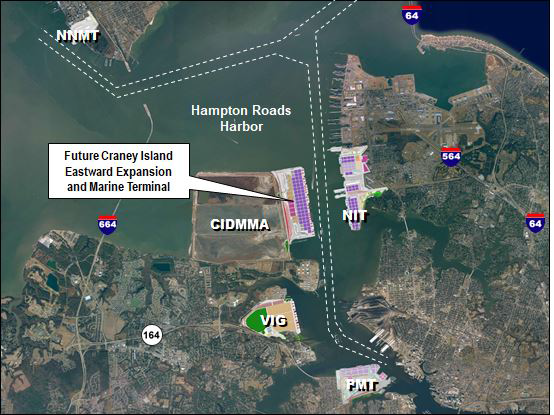 The Corps identified that the Craney Island site would reach capacity in 2025, and the Virginia Port Authority predicted that its Hampton Roads terminals would reach capacity in 2011 and a new terminal was needed. 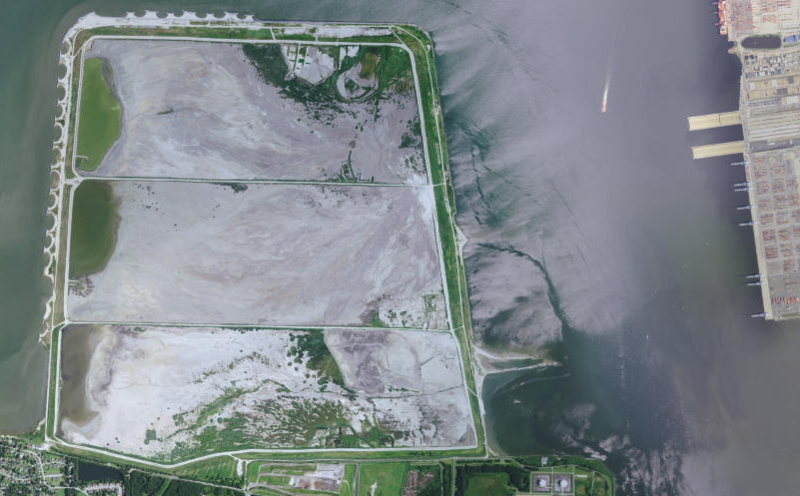 The Corps had a solution to both problems: expand the Craney Island disposal site eastward into the Elizabeth River and construct of a new marine terminal on the newly-formed land created from dredge spoils. Norfolk's competitors are not just Savannah, Baltimore, New York/New Jersey, or even the Gulf Coast ports such as New Orleans. Ships can steam across the Pacific Ocean to West Coast ports in 12 days. Containers can be carried from Los Angeles, Seattle, or other West Coast ports by train/truck to East Coast destinations in another 5-8 days. Ships going through the Panama Canal to an East Coast port require 24 days. Hampton Roads has advertised a 50-foot outbound channel since it was dredged in 1989 to accommodate large ships exporting heavy loads of coal, and a 50-foot inbound channel since 2007. Norfolk International Terminals (NIT) has loaded container vessels that required a 49-foot channel to exit through the Chesapeake Bay. The Port of Virginia competes with other states in part because no other port exceeds the depth of the Hampton Roads channel. A least one shipping line designed port visits to include a "last stop" at Norfolk, topping off a large container ship's load there because other ports with shallower channels could not accommodate a fully-loaded vessel. The Chesapeake Bay Bridge-Tunnel under the Thimble Shoal Channel, the Hampton Roads Bridge-Tunnel under the Norfolk Harbor Channel, and Monitor-Merrimac Bridge-Tunnel under the Newport News Channel are buried at least 63 feet deep below the bottom, so the challenge is financial rather than physical. Virginia's elected officials and business leaders consistently lobby the US Congress to fund its already-authorized plans to dredge the inbound and outbound channels to 55 feet and widen the channels so large ships could maneuver safely. With a deeper and wider shipping channel, Virginia could compete better against Baltimore, Miami, and New York/New Jersey, the three rival East Coast ports that also have 50-foot deep shipping channels. 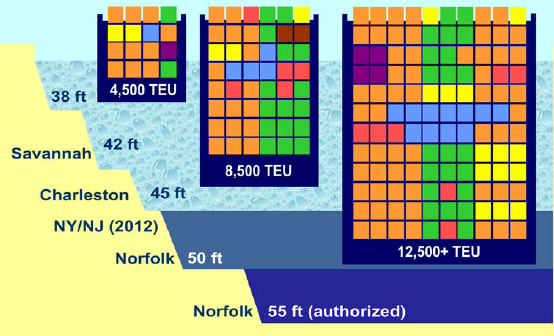 The existing 50-foot deep shipping channel allowed the Port of Virginia could grow beyond its former capacity to handle a 10,000 TEU ship (i.e., carrying 5,000 containers that were each 40-feet long). Once the port increased container-handling equipment and procedures for moving containers on land, it was able to attract ships carrying 13,000-14,000 TEU's each week, starting in 2017. The Virginia Maritime Association still described widening and deepening the channel as the #1 priority for upgrading port infrastructure at Hampton Roads. During part of the four hours required to move an Ultra-Large Container Vessel (ULCV) 28 miles from the Atlantic Ocean to the Norfolk International Terminal (NIT), the 1,000-foot wide channel is made into a one-way route at the Thimble Shoal islands of the Chesapeake Bay Bridge-Tunnel. Restricting that traffic flow delays other vessels. The Virginia Maritime Association advocated that the Corps of Engineers and Port of Virginia expand the 2018 update to studies proposing to deepen the channel to 55 feet, and to include a proposal to dredge the Thimble Shoal to 1,400 feet wide. That would eliminate the one-way bottleneck. 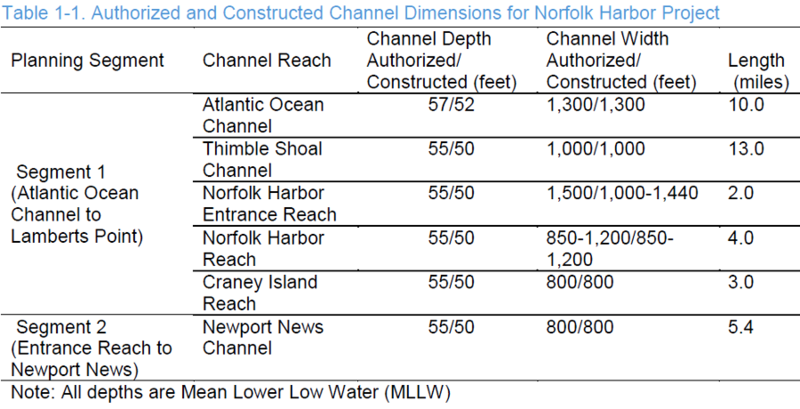 In late 2017, the US Army Corps of Engineers recommended channel alterations in Hampton Roads that included widening the Thimble Shoal channel to 1,200 feet. Dredged materials ("spoil") would be deposited at the Dam Neck Ocean Disposal Site, the Norfolk Ocean Disposal Site, or the Craney Island Dredged Material Management Area. 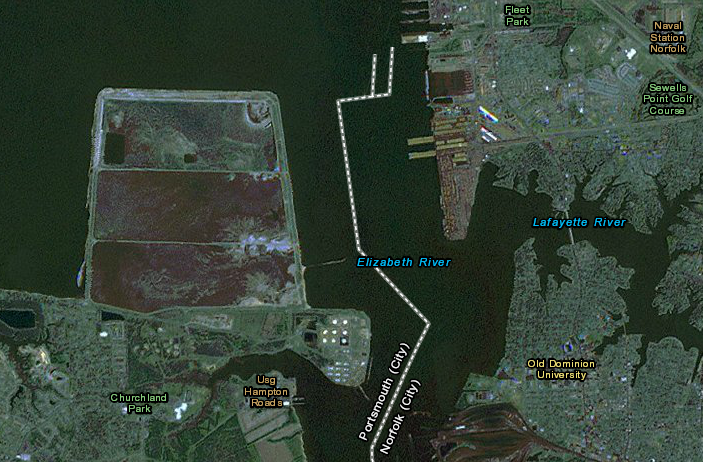 The Corps committed to develop recommendations for the Elizabeth River Southern Branch (ERSB) Navigation Improvements project in a separate study. Constant dredging is required to keep the channels at their advertised depth. The US Army Corps on Engineers calculates every year which portion of which channel needs maintenance. On occasion, emergency dredging is required. 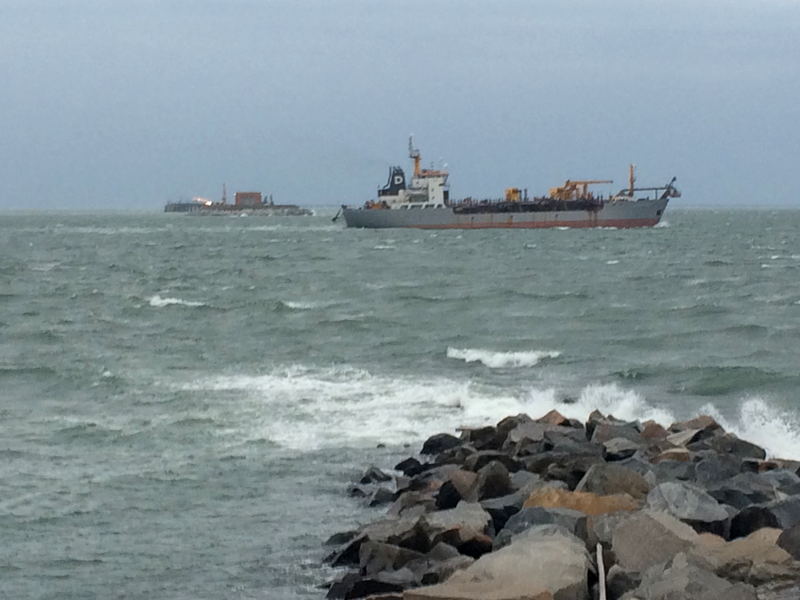 In 2011, a bulk carrier loaded with coal ran aground in the middle of the Thimble Shoals channel. The ship required only 47 feet of depth, so no one expected it to hit bottom in the 50-foot channel. Slumping sediments and Chesapeake Bay currents had filled the channel until it was only 41.1 feet deep. When not needed for beneficial uses to widen the beach at Virginia Beach, Willoughby Spit, and Sandbridge or to construct dikes at the Craney Island Dredged Material Management Area, the excess dredge spoils from the Atlantic Ocean Channel and the clay-rich material dredged from the Thimble Shoal Channel are deposited at the nearby Dam Neck Ocean Disposal Site (DNODS). Spoils from dredging between Sewells Point and Lamberts Point on the Elizabeth River, the Newport News channel, and the associated anchorages are deposited at the Craney Island Dredged Material Management Area. Costs to haul the dredge spoils to an alternative disposal site in the Atlantic Ocean would be higher, and some of the material is too contaminated from old industrial operations around the harbors to permit disposal at sea. One factor in dredging at Hampton Roads is the risk if unexploded ordinance. Since colonial days, shells fired into the water have sunk to the bottom without exploding. Though many have been waterlogged and become inert, dredge boat captains know that they may retrieve some shells that could be dangerous. The Corps of Engineers has identified a variety of historic shipwrecks to avoid when dredging or depositing spoils from the channels. One archeological resource is the remains of the U.S.S. Cumberland, a Union ship sunk by the new C.S.S. Virginia ironclad in the Civil War. All ports know that Federal funding to deepen shipping channels could enhance or erode competitive advantages. The other two main competitors to the Port of Virginia, Charleston and Savannah, have their own plans to attract the largest container ships to the East Coast. Savannah, Georgia has a 23-mile channel from ocean to port. When the channel was deepened from 38 feet to 42 feet in 1994, the goal was to service ships carrying up to 4,000 TEU's. By 2013, ships calling at Savannah arrived with less than a full load. 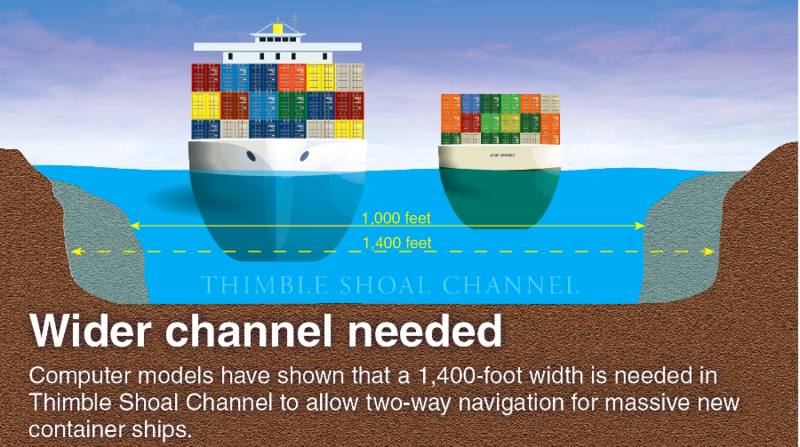 They could carry up to 8,100 TEU's, if the channel was 48-feet deep. Getting Federal support to deepen shipping channels or upgrade on-shore infrastructure (such as rail/road connections) requires lobbyists in Washington, who advocate for staff to include specific language in authorization/appropriation legislation, then encourage Members of Congress to approve funding that benefits a specific port. Representatives of all ports in serious competition for Federal funding must educate Congressional staff and members on the economic potential of port expansion - "if only Federal funding were provided to (...insert name of port here...), then (...insert what good things would happen there...)." The Virginia Port Authority has planned for expansion, particularly for processing containerized cargo from the supersized ships that started to arrive after widening of the Panama Canal. The port predicted that the number of containers to be processed would triple between 2015-2035. Larger ships will bring more containers, and the Virginia Port Authority seeks to increase the number of visiting ships to more than 2,000/year. 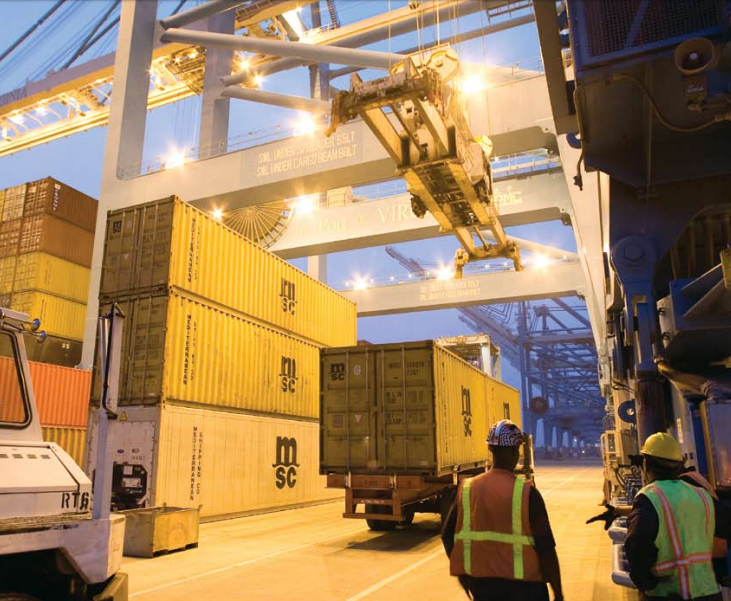 To handle the extra containers, capacity at the Norfolk International Terminal (NIT) and Virginia International Gateway (VIG) were doubled with new equipment. In 2016, the first ship with a 10,000 TEU capacity arrived at Norfolk International Terminal (NIT). In 2017 the COSCO Development, a 13,000 TEU ship, arrived at the Virginia International Gateway (VIG) terminal. That ship's routine stops included Hong Kong, Yantian, Ningbo, Shanghai, Panama, Virginia, Georgia and South Carolina. New York/New Jersey was not on the rotation in early 2017 because the project to raise the Bayonne Bridge had not been completed yet. Ships carrying more than 9,800 TEU could not enter the New York/New Jersey harbor until later in 2017, giving Virginia a head start in building trade relationships. Once the bridge was raised, the shipping line altered its sequence for ports of call for large vessels such as the COSCO Development. It made New York/New Jersey first, then Norfolk, Savannah, and finally Charleston. For years, we have been talking about the "next generation" of vessels and the "big-ship era." This is what we have been preparing for: the talk is over, the big ships are here. By 2018, shippers had relied upon specialized container ships for 60 years. 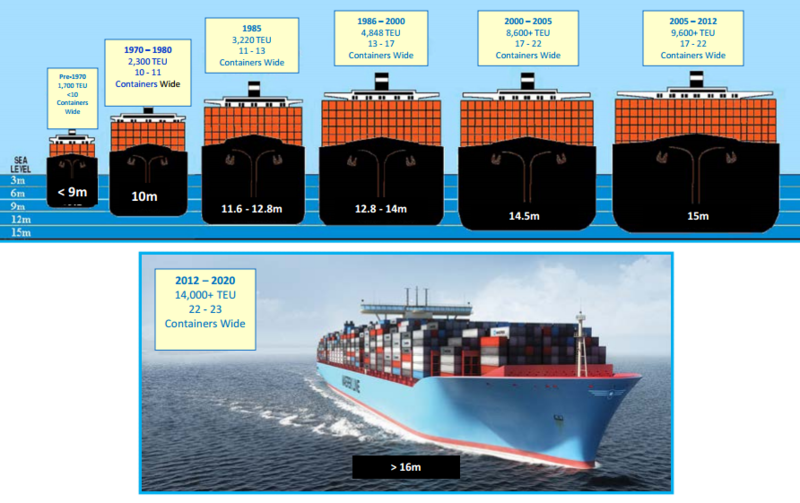 The largest container ship in the world could carry over 20,000 Twenty-Foot Equivalent Units (TEU's), and Virginia port officials were considering how to load/unload ships with a capacity of 16,000-18,000 TEU's. The Craney Island Marine Terminal (CIMT) could be designed from the beginning to accommodate larger ships. 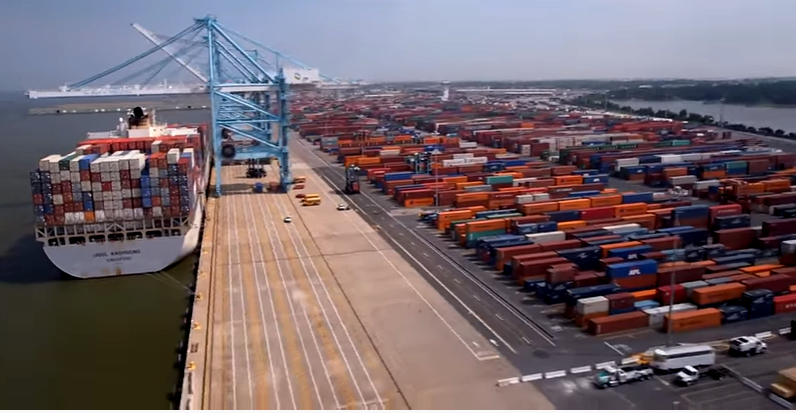 The Virginia Port Authority and the Corps of Engineers will continue the Craney Island Eastward Expansion project, so the terminal could be built when justified by demand for extra container processing capacity. If the deepest water for containers ships was at Hampton Roads, then shipping companies could design their routes so the terminals in Norfolk, Portsmouth, and Newport News would be "first-in, last-out." Vessels importing the most containers would stop first in Virginia. Ships headed back to Europe, Asia, or elsewhere would get their last containers from a Port of Virginia terminal. Many ships already follow that route design. 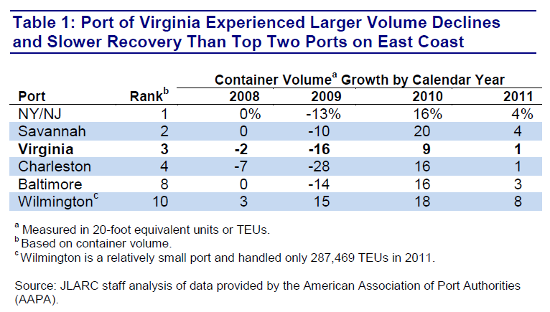 Just having a deeper channel might not help the Port of Virginia compete if other ports also get deeper channels. Virginia and Georgia have chosen to partner in order to compete with New York/New Jersey and Charleston. The Georgia Ports Authority and the Virginia Port Authority created a East Coast Gateway Terminal Agreement in 2017 to coordinate the arrival of ships, so large customers such as Wal*Mart could maximize the efficiency of container distribution to warehouses along the East Coast. The Federal Maritime Commission approved the deal, claiming that exchange of information was intended to enhance supply chain logistics. Since the two ports could not set joint prices, the Federal agency concluded that the agreement did not create unfair competition for other ports. 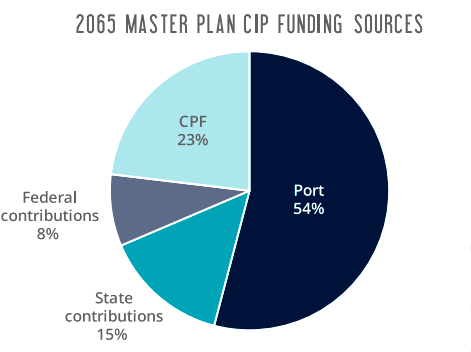 Competition for Federal funding to deepen shipping channels is based on the claim that each port needs to dredge deeper in order to accommodate the bigger container ships. However, the COSCO Development required 44 feet or less when it visited Norfolk for the first time in 2017. The original justification for a deeper channel in the Elizabeth and James rivers was the need to accommodate larger ships exporting Appalachian Plateau coal to foreign markets. Containers can be much lighter in weight than coal, so the need for a deeper channel for the Post-Panamax container vessels has been questioned. 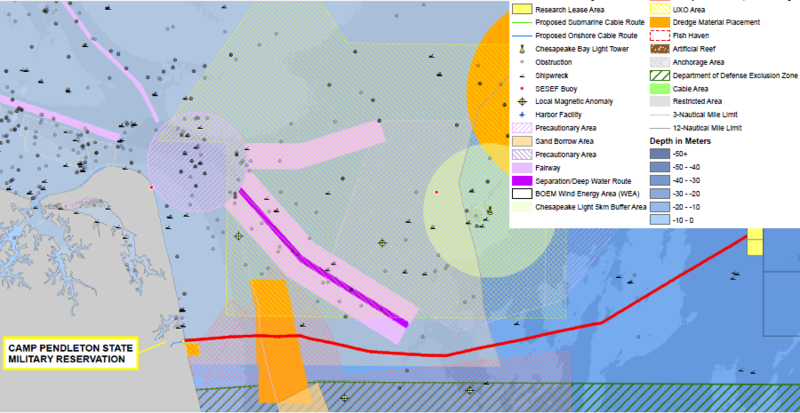 On May 8, the COSCO Development sailed into Virginia with a 44' draft: five feet (5') from its potential deepest draft. However, with our current 50' channel depths, it was just one foot (1') from an anytime sailing transit � not tide dependent -- and just three feet (3') from what we would take out under a special tide sailing in Virginia. 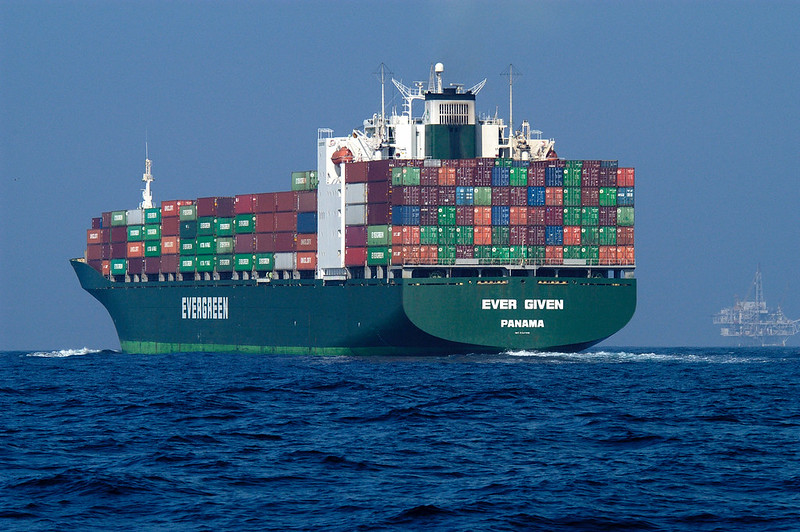 Every foot of draft on a containership represents millions of dollars� worth of cargo. Shippers, cargo owners, shipping lines and ports want to maximize those economics and the port that successfully moves ships at deep drafts will act as a magnet for international commerce. New York/New Jersey attracts ships as a "first-in" site because its high population means many containers are directed to warehouses in that area. Savannah attracts ships because so many distribution centers for the southeastern US are clustered there. Congress is at risk of providing more funding than is required to meet shipping infrastructure needs Politics may end up directing Federal subsidies so one or more ports become "winners" with the deepest channels, while others are left behind. Despite a 1994 state law prohibiting Virginia state agencies from hiring lobbyists, in 2013 it was revealed that the Virginia Port Authority was paying for such services. The state agency tasked its engineering contractor to perform advocacy to legislators, paying a 15% surcharge for the engineering contractor to make arrangements with a standard lobbying firm. The US Congress may choose to fund multiple channel deepening projects at multiple East Coast ports. Polticians from Florida, Georgia, South Carolina, and New Jersey/New York desire for the Corps of Engineers to deepen channels to their ports. Multiple projects would increase costs and dilute the economic benefits, but funds for channel deepening could be decided by political calculus more than cost-benefit studies. ...the channel deepening project marks an important status for the port, which in recent years lost its ranking as the deepest port on the East Coast as several other ports dredged their harbors to match its 50-foot depths. South Carolina is dredging its channels to 52 feet. In 2018, the Virginia General Assembly authorized $350 million in state funding (including $330 million in state-backed bonds) for deeping the channels to 55 feet and widening to 1,400 feet. However, the 2019-20 Federal budget proposed by President Trump included no funding for Norfolk, but did include proposed funding for the rival ports of Boston, Charleston, and Savannah. State officials chose to start dredging the Thimble Shoal channel to 56 feet in depth anyway, and anticipate getting the Federal share of funding later. One supporter was Rep. Rob Wittman, who introduced legislation to provide $4 billion in funding for Virginia's port projects. 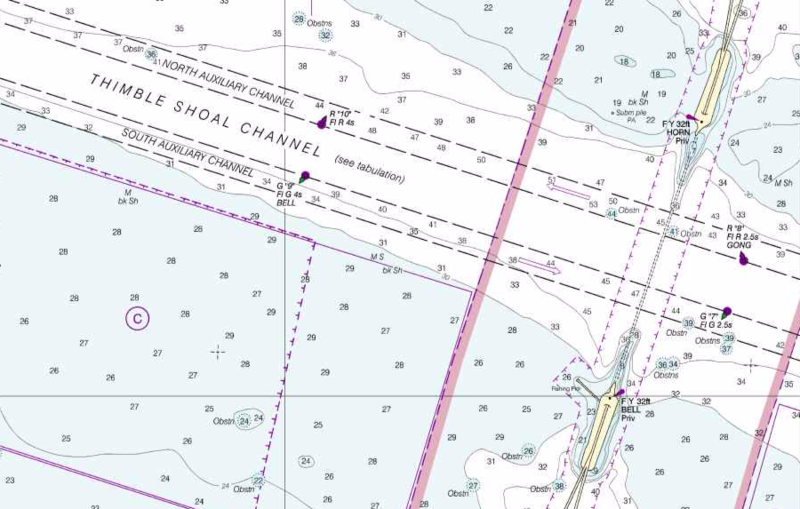 In 2018, the US Army Corps of Engineers had authorized deepening the Thimble Shoals channel to 56 feet, deepening other channels closer to the terminals to 55 feet, and dredging the Atlantic Channel offshore to 59 feet. The problem then became Federal0 funding, not Federal approval. Lamberts Point Coal Terminal, Norfolk, Va.